The visual, as we experience it, constantly shifts between the seen and the unseen, and yet, to become an image, something, something even quite slight, must take hold and linger. The Tape Print Series invites the viewer to consider the sticky nature of the image. Images are held by the materiality that shapes them, much like a footprint is held in the compression of snow, or dirt. 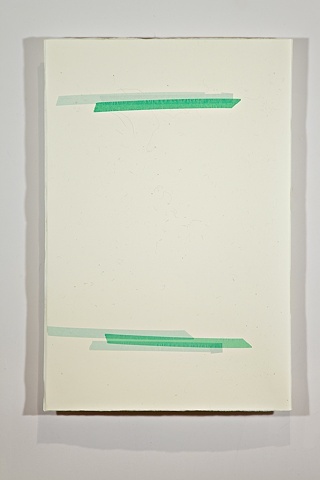 In this series of five works (shown within this portfolio) images of the front and back (or, sticky) side of common green masking tape is printed on the front and on the back two sheets of paper (one a heavy rag paper, the other, a thin, translucent Japanese paper). When laminated together, the two sheets of paper are allowed to trap and suspend any dust and detritus found on the floor of the artist's print studio  compressing the elements of tape, dust, and paper into an image held somewhere between the real and the illusion of the real.